PennsylvAsia: Japanese animated movie A Silent Voice (聲の形) in Pittsburgh, January 28 and 31. 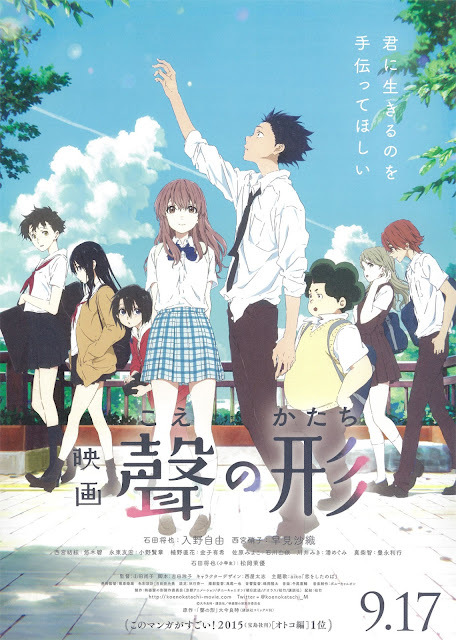 Japanese animated movie A Silent Voice (聲の形) in Pittsburgh, January 28 and 31. The story begins with a deaf elementary school girl named Shoko Nishimiya, who transfers to a new school and meets a boy named Shoya Ishida. Shoya, who is not deaf, leads the school in bullying Shoko over her disability. The bullying escalates, and so Shoko transfers to another school. Immediately, the class and even Shoya's closest friends, bully him for having bullied Shoko. Shoya loses contact with Shoko, and for years he suffers the consequences of his guilt. Upon entering high school, Shoya finally decides he must find Shoko, determined to make amends for what he did in elementary school and to become Shoko's friend. Along the way, he meets new and old faces, and struggles with many complicated relationships and feelings. It will play in Japanese with English subtitles on the 28th at Southside Works Cinema and the Monroeville Mall Cinemark, and dubbed in English on the 31st in Monroeville. Tickets are now available online.